Derek was named to the 2018 Associated Press All-State First team as a defensive back. He was also named as a first team receiver to the Detroit Free Press, Honorable Mention Defensive Back by the Detroit News All-State, Michigan High School Football Coaches Association Dream Team defensive back, Lansing State Journal Dream Team defensive back and Capital Area Activities Conference Blue Division All-League. The versatile Hamp, recognized for defensive and offense abilities, also returned punts and kickoffs for the Panthers. Some of the catches he made, well, were just amazing. One handed catches, between defenders and over top of defenders. At East Lansing, Hamp caught a touchdown pass and had two huge interceptions in the second half that were key to the Panther defense shutting out the powerful Trojans. He played a key role in the highly successful 2017 and 2018 seasons with trips to the Regional Finals and State Semi-Finals. 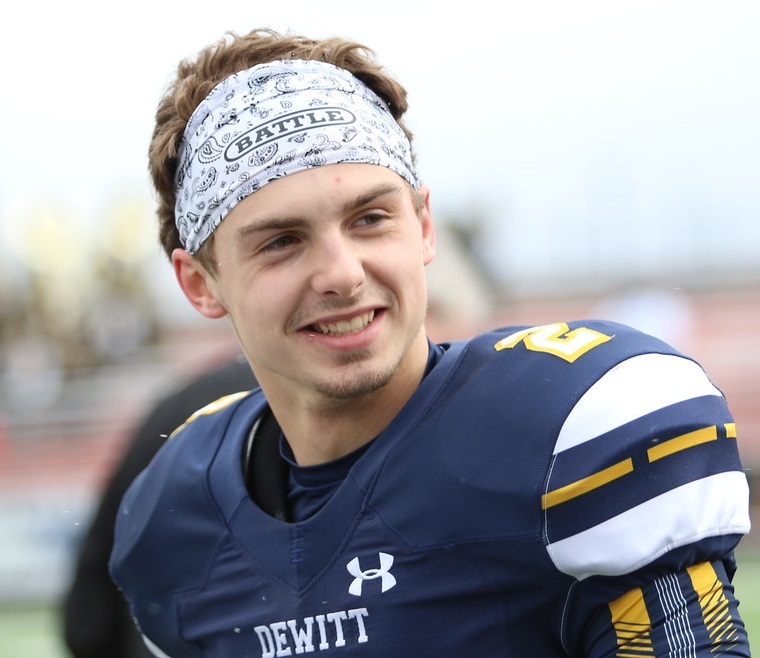 Overall, DeWitt was 22-3 and two conference championships. For his career, Hamp caught 52 passes for 771 yards and 12 touchdowns, returned 10 kickoffs for 232 yards, 21 punts for 319 yards and a 15.2 average. Defensively he had 59 solo tackles, 25 assists and two sacks along with causing two fumbles, recovered a fumble and had 7 batted passes and 7 interceptions.